A friend gave me this book, for releasing. Yoo Hoo! Finally, another Kingsolver, the last one. I love the work of this woman so much, I wanted to read everything she has ever written. This is the book she has started her writing career with. "..Set is the small minig towns of Arizona, the story is partly oral history and partly social criticism, exploring the process of empowerment which occurs when people work together as a community." This is exactly the thing I need to hear about, and then written by my all-time favourite author! This is a true gem. Getting this book from the US to Europe required a little cooperation, too. I am so glad we succeeded. Thank you, The-harvest-queen! Happy harvesting! And thanks for the lovely card! I wanted this book primarily because I am a big fan of Barbara Kingsolver's work and I couldn't stand the idea of there being one single book by her which I have not read. "Novelist Barbara Kingsolver began her writing career with 'Holding the line'. It is the story of how women's lives were transformed by an eighteen-month strike against the Phelps Dodge Copper Corporation. 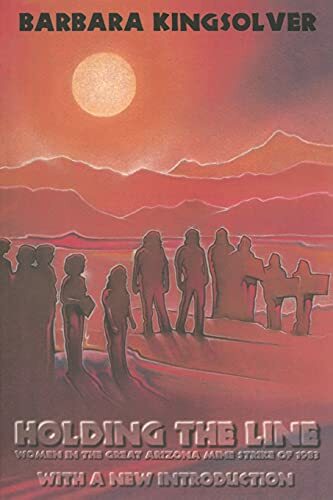 Set in the small minig towns of Arizona, the story is partly oral history and partly social criticism, exploring the process of empowerment which occurs when people work together as a community. For this new edition, Kingsolver has revised the first chapter and written a new introduction, which explains the book's particular importance. (Kingsolver:) "'Holding the line' was a watershed event for me because it taught me to pay attention: to know the place where I lived. Since then I've written other books, most of them set in the vine-scented, dusty climate of Southwestern class struggle... My hope for you, as a person now holding this book, is that the reading will bring you some of what the writing brought to me. Whether or not you can claim any interest in a gritty little town smack in the middle of nowhere that hosted a long-ago mine strike, I hope in the end you will care about its courage and sagacity." Which is exactly what it did to me. Also it has deepened my understanding of Barbara Kingsolver's other books, and the reason they have affected and touched me so deeply. Kingsolver reaches out to me, in all her books, with an urgent plea to open my heart and feel connected.